On tonight’s Lawrence O’Donnell program The Last Word, I heard a theory proposed to explain the latest version of Mitt Romney. 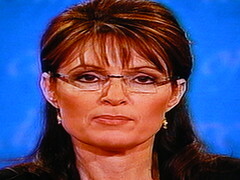 Mitt shook the Etch-a-Sketch and saw an ink blot that he thought resembled Sarah Palin. Aha, he thought, I’ll abandon any and all unpopular ideas I have had and just go rogue. I think that the theory has merit. We shall see in the next few weeks if it is true. Reblogged this on Ye Olde Soapbox.